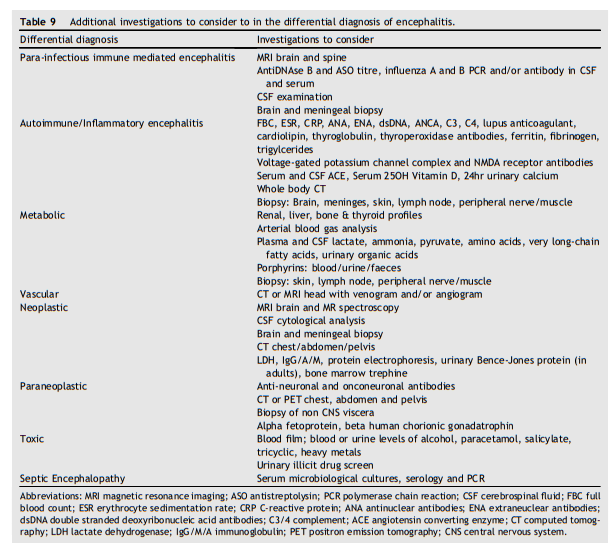 limitations of this, surrogate clinical markers of inflammation are used (Table 1. Definitions). or post-infectious causes, and non-infectious causes. 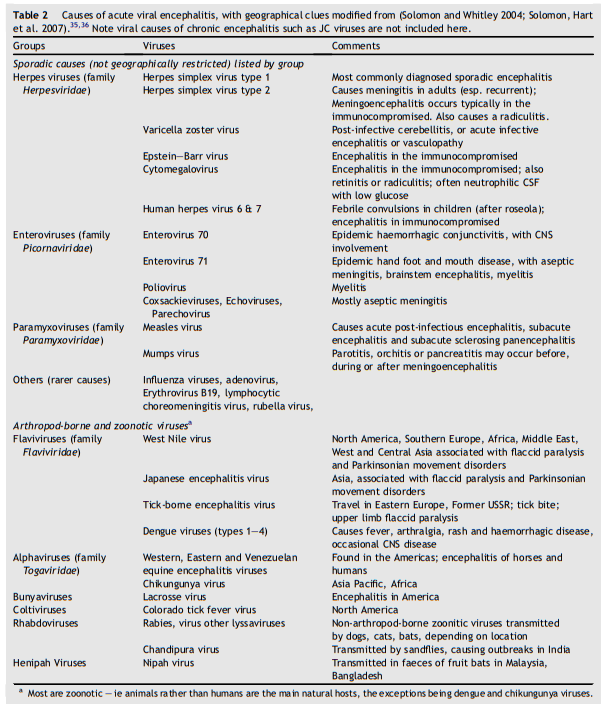 Infectious causes include numerous viruses, bacteria (especially intracellular bacteria such as Mycoplasma pneumoniae), parasites and fungi (Table 2. 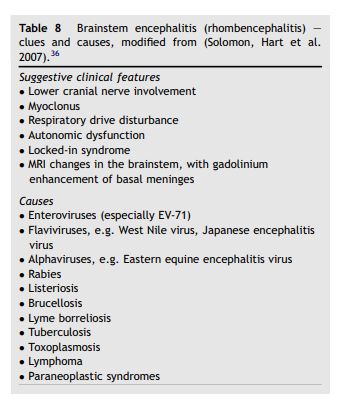 Causes of viral encephalitis; Table 3. 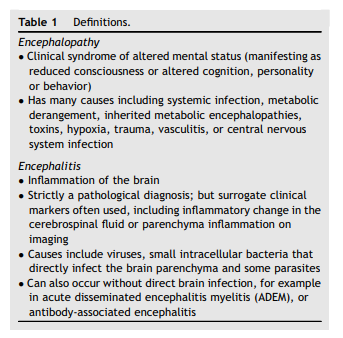 Non-viral causes of encephalitis and encephalopathy). be preceded by a computed tomography scan? (e.g. 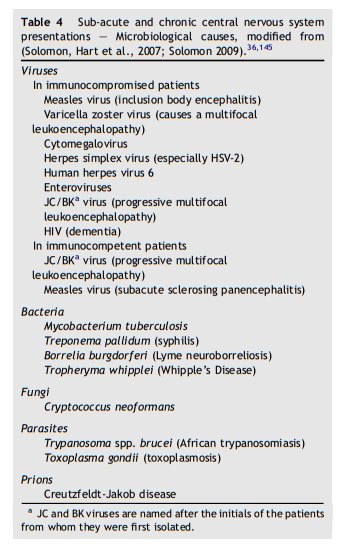 throat swab, stool, vesicle etc)? 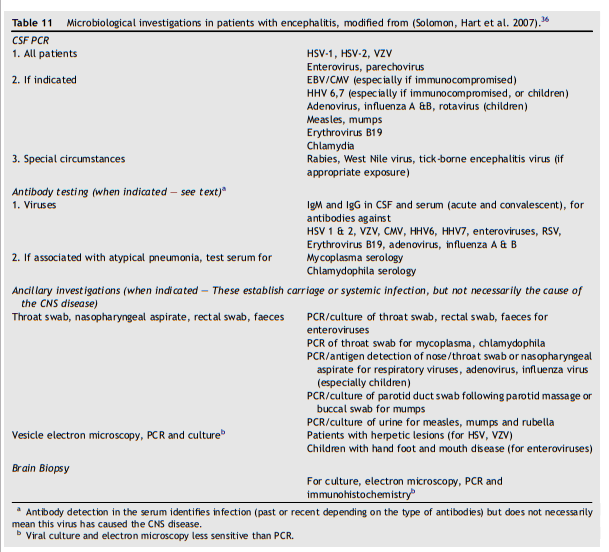 What is the role of magnetic resonance imaging (MRI) and other advanced imaging techniques in adults with suspected viral encephalitis? should have an electroencephalogram (EEG)? Please see pp 362 + 363 for further information on HSV rx. 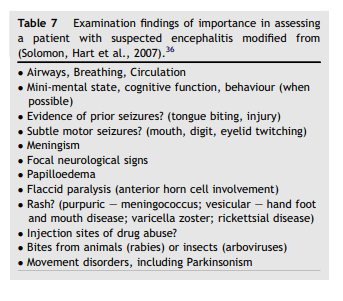 encephalitis in the returning traveller differ? 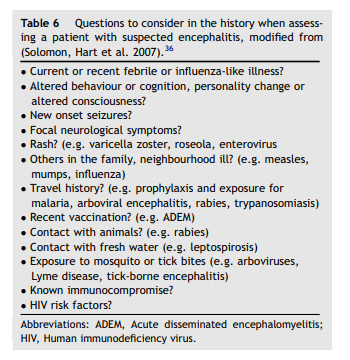 suspected encephalitis in the immunocompromised? A CT head scan before LP should be considered in patients with known severe immunocompromise (B, III). 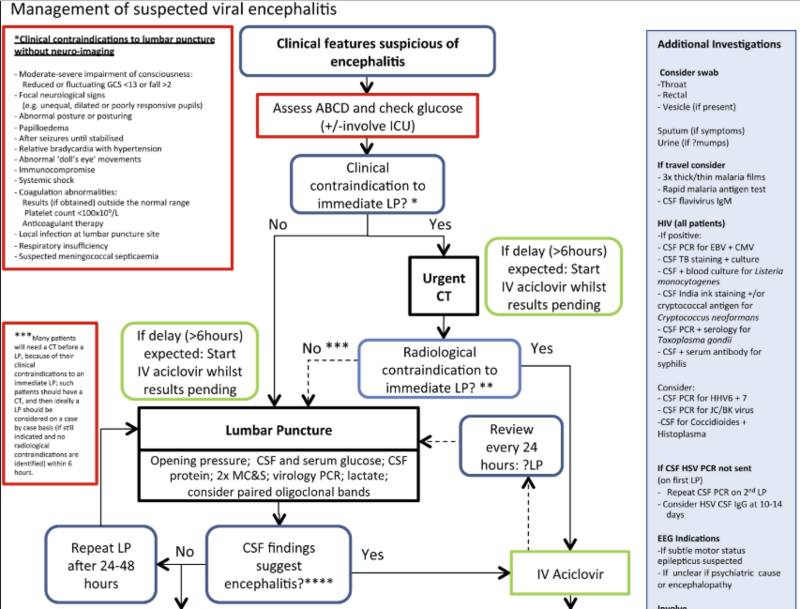 (1) Management of suspected viral encephalitis in adults – Association of British Neurologists and British Infection Association National Guidelines [PubMed Abstract] [Full Text HTML] [Full Text PDF]. J Infect. 2012 Apr;64(4):347-73. doi: 10.1016/j.jinf.2011.11.014. Epub 2011 Nov 18. The above article has been cited by 50 articles in PubMed Central. 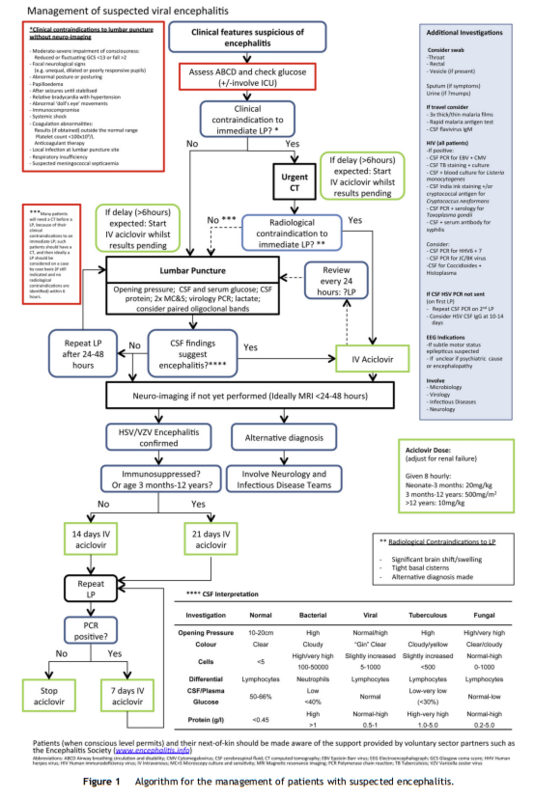 (2) SUMMARY DOCUMENT: Management of Suspected Viral Encephalitis in Adults – Association of British Neurologists and British Infection Association National Guidelines [Link is to the Word download – this file can also be opened with OpenOffice which is free]. 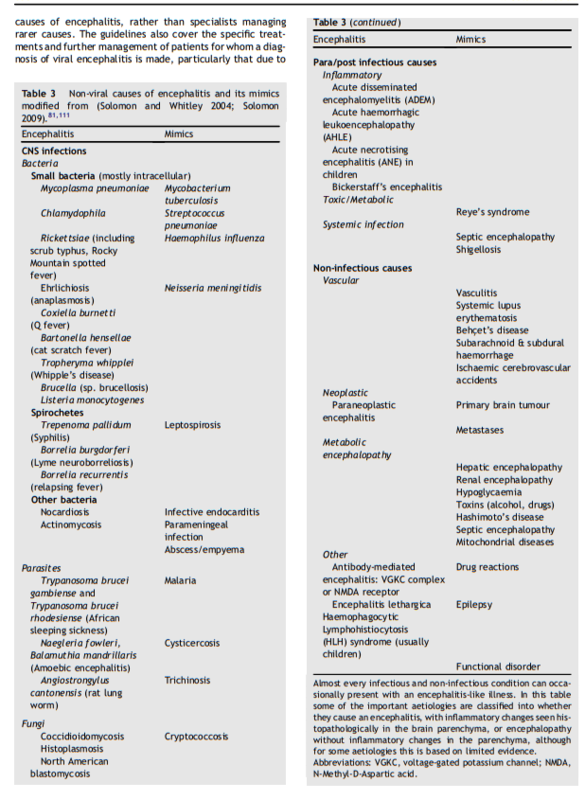 This entry was posted in Autoimmune Diseases, Critical Care, Neurology. Bookmark the permalink.